Mars Pet Care has relaunched Whiskas Tasty Textures for cats in Australia with an animated 3D purple cat appearing in two television commercials and online at The Cat Lounge. He’s warm and loving, yet cheeky and mischievous, and knows how to get his Whiskas. A woman working on her computer is interrupted by her hungry and persistent 3D purple cat. It’ll be worth the wait, she says, as she pulls out the new Whiskas Tasty Textures. The Purple Cat turns up again at The Cat Lounge, an interactive site being developed in collaboration with online visitors. 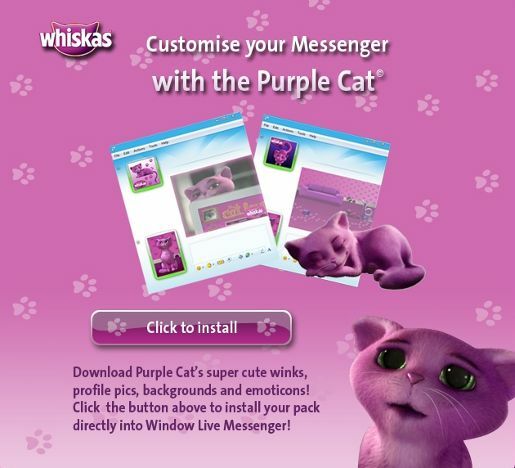 Whiskas fans can download Purple Cat winks, profile pics, backgrounds and emoticons for Windows Live Messenger. The Whiskas campaign was developed at Whybin TBWA, Melbourne, by creative director Scott Whybin, art director Bruce Baldwin, copywriter Michael Syme, planner Jacqueline Wang, account director Hazel Tiernan, account manager Kelly Bollen. See the Whybin TBWA hosted version of the ad online. Filming was shot by director James Holt via Luscious International with producer Susie Douglas and director of photography David Knight. Special effects were developed at The Lab, Sydney, by head of 3D Clinton Downs, character designer Daniel Bavell (Supervixen), VFX supervisor Soren Jensen, producer Linda Lum, colourist Marcus Timpson, Flame artist Eric Schaechter and second Flame artist Scott Geersen. See images from Bavell’s development of the Purple Cat online at Behance. Read more about the Lab Sydney take on the campaign at Campaign Brief. Media was handled by Starcom.